Rajma Chawal brings a bright shiny twinkle in my eyes. The smell of Rajma smearing in the onion tomato gravy with whole spices lures me deeply to dive in my plate of Jeera Rice soaked in Rajma Masala! And this happens to me every single time I think of Rajma Chawal. 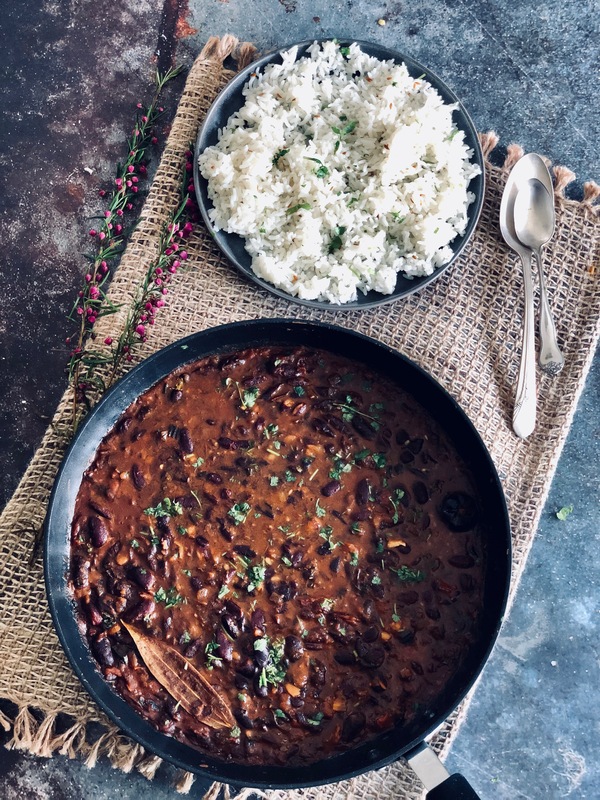 Rajma’s are beautiful Red Kidney Beans which are packed with protein and serve so many health benefits that I almost put them in my superfoods bucket which gives us a good amount of iron, vitamins, fats, fiber and carbs. They help with amazing health benefits like preventing fatty liver, reducing risk of cancer, diabetes and glucose metabolism, etc . I was never obsessed about Rajma growing up since they were not made quite often at my home. I think I started loving them absolutely when I was in my undergrad. I tasted them in this restaurant called Mirch Masala when I was visiting with my friends and that truly did some magic for me. Ever since then, I haven’t stopped eating them. My take on Rajma curry is very simple with an added twist of adding scallions (spring onions) and Kasuri methi in the tadka! Trust me it tastes absolutely delicious and smells so good. Rajma Masala is an Indian Curry delicately spiced with rich Indian spices smeared in onion tomato gravy, so scrumptious that it literally melts in your mouth. This curry is healthy, gluten-free and vegan. We enjoy this curry with Jeera Rice or Plain Rice. Drain the water next morning and pressure cook the soaked Rajma with 2 cups of water + Salt for about 7-8 whistles. In a Heavy Bottom Pan, heat oil and add cumin seeds, bay leaf, a pinch of asafoetida (hing), a small cinnamon stick and a whole dry red pepper. Once the Cumin seeds start to splutter, add chopped scallions and kasuri methi (dry fenugreek leaves). Sauté them until it starts smelling nice and roasted. Add finely chopped onions and salt. Adding salt at this stage will help onions cook faster. Let them caramelize a little. Add Ginger Garlic and Green Chili Paste and sauté until the raw smell goes away. Add tomatoes, turmeric powder, red chili powder, coriander powder, and 1/2 tsp garam masala. We will use another 1/2 Tsp of garam masala in the end. Sauté well untill tomatoes are nice and mushy. Keep 1 cup of Boiled Rajma Rajma separately and mash them using a masher or your hands. Once the tomatoes are mushy, add the mashed rajma and mix them well with all the spices. Now add the whole boiled Rajma and give it a nice mix. Add 1/2 cup of water. I use the same water using which I boiled my Rajma. This water will have all the nutrients present from Rajma and I don”t like to throw it away. Add Kasuri Methi and Garam Masala. Give it a mix and let it boil for another two minutes and enjoy with Jeera rice or Plain Rice. This entry was posted in Indian Curries. Bookmark the permalink.